In 1971, a small shop on South Congress Avenue in Austin, Texas was home to a single, one-of-a-kind sandwich. Don and Dolores Dissman opened the first Schlotzsky’s with only one product – an 8-inch muffuletta stuffed with three meats, cheeses, lettuce, tomato, olives, and dressing served on hot freshly-made sourdough bread. Modeled after the muffulettas they discovered in an Italian grocery store in New Orleans’ French Quarter, the Original® sandwich (at the low price of $2.95) was an instant hit! The uniquely named company – called Schlotzsky’s for no particular reason – quickly became a favorite in South Austin. Targeting hungry college students, the Dissmans decided to open their second restaurant in Dobie Mall just a few years later. 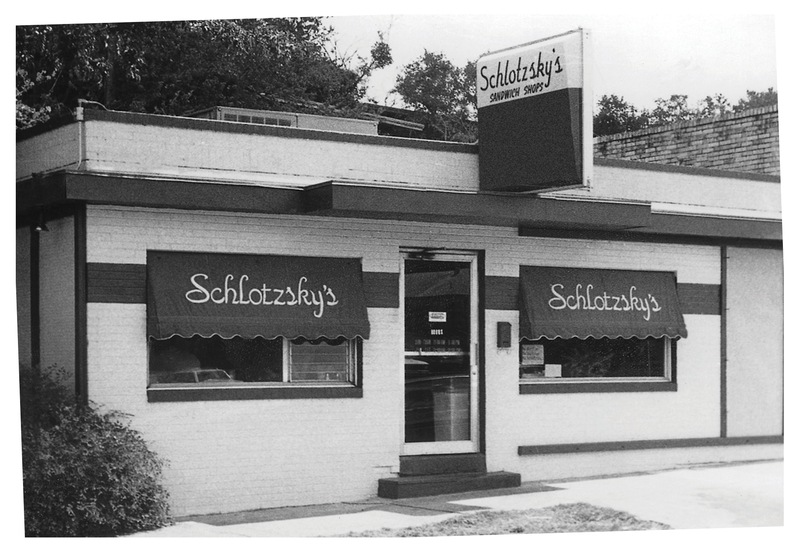 In 1977, the couple began franchising their unique concept, and Schlotzsky’s quickly became a Southeastern favorite. By 1981, the company had 100 franchise restaurants. That same year, the Dissmans decided to retire from the sandwich business, so they sold the company to Austin real estate investors, John and Jeff Wooley and Gary Bradley. A year later, Bradley split with the Wooleys when he took the real estate business and the Wooleys kept Schlotzsky’s. Under the Wooleys’ direction, Schlotzsky’s menu expanded to include specialty pizzas, toasted wraps, freshly tossed salads, gourmet soups, Panini, and other items. In 1988, Schlotzsky’s introduced their Fresh-from-Scratch® products to Canada – the first restaurant outside the U.S. In 1995, the Wooleys took the company public on December 15, 1995, trading as BUNZ on NASDAQ until 2004, the same year that Bobby Cox Companies came on board. Under new ownership and management, Schlotzsky’s spent two years strengthening its franchise operations and reinvigorating the brand. On November 17, 2006, the company was purchased by FOCUS Brands, which has brought stability and continued efforts to expand the brand and clearly define the concept’s niche and overall identity. In 2008, Schlotzsky’s began co-branding with sister company Cinnabon by including by including the Cinnabon Classic Roll and other select Cinnabon items inside Schlotzsky’s restaurants under one roof. The following year, the company began an extensive reimage project with the opening of its first “Lotz Better” prototype in Waco, Texas. In 2010, the brand reinvention was launched, which is literally and figuratively “All ‘Round Lotz Better,” and includes the Waco prototype design featuring vibrant colors, playful slogans, contemporary furniture and artwork. The company also introduced a new service model where crew members hand-deliver food to the tables. The brand reimage was completed in 2011, the same year Schlotzsky’s celebrated its 40th birthday with a national $1.99 small The Original® special. The menu was revamped and Panini sandwiches were discontinued and fresh, made-to-order salads were added. In 2012, the company proudly celebrated seven consecutive years of positive same store sales growth. JDRF (Juvenile Diabetes Research Foundation) was announced as the company’s corporate national cause and through a systemwide promotion, collected more than $150,000 for the organization. ● Since 1982, has sponsored the Schlotzsky’s Bun Run, Austin’s longest-running 5K, which hosts a current average of 5,000 competitive runners and raises an average of $50,000 annual for the Austin YMBL Sunshine Camps. You once had a shop in St. Louis, MO… years ago. I wish you would come back to the midwest. I live in Bethalto, IL and work in St. Louis, MO 63110, our offices are off Oakland in the Highlands Plaza complex. They have retail space open… really wish you would consider another shop in this area. Several people in our office remember and love your sandwiches. I wonder if I had some delivered they would taste just as good? LOL Have a great day… Miss your sandwiches. This guy living in the white house in Washington D.C. said, “once change happens things will turn around for the better”. Well they’ve never had a Schlotzsky’s in Washington…so what he probably meant to say is when Washington DC finally gets its first Schlotzsky’s America will get back to normal. Until then we’ll all be miserable without having any Schlotzsky’s to go to. There was a Schlozskys near UDC at Van Ness red line stop until summer of 2009. Then it bugged out. Used to take my kids there every time I went downtown. A Potbelly was there the last time I checked. That’s too bad. I really liked that place. I used to go when I would swim at UDC. I lost my connection at UDC, so I haven’t even been by there. I loved the jalapeno cheddar bread. Yum! What happened to the Schlotzky’s on Connecticut near the DC Zoo.? I remember eating there in 2006. Last time I was there .. they had closed it. Could you tell me were I can find out how your online order works and if there is a minimun required before you can use it? What do you charge for delivery and if I decide that I will pickup where do I do this? I miss the Schlotzsky in St. Louis. I visit my son in Kansas City this pass weekend and visited the Schlotzsky in Mission Ks twice and enjoyed both times. We miss St. Louis, too, Jim. But thanks for visiting us in Mission. Glad you liked it! come to bessemer,alabama please i miss you’re great food. I’d love to see a Schlotzsky’s Deli in or near Detroit! I haven’t had one of your awesome sandwiches since I left the Marines in 2000. I fell in love with Schlotzsky’s in Jacksonville, NC back in 1998! I worked at the hoover Alabama store when it opened in 1992 and worked there til mr.lane sold the franchise in 2000. please open one in my area soon I so miss the food!!!!!!!!!!!!!!!!!!!!!!!! You are still missed in Orlando, Fl. Come back. Looking foward to your new stores in Southern California. As a former Texan, I’ve missed your sandwiches. Started visiting your restaurants in 1980 while I was a student at Texas Tech in Lubbock. Always eat at a Schlotzsky’s whenever I’m visiting. I moved to Austin in 1970, and the first schlotsky,s –# 1– opened 1n 1971 0nly , one blk. from the barber shop , which, I worked .. it was like heaven, having one with-in walking distance.–still eating them. We miss you in Raleigh! Lots of new buildings going up downtown and midtown where we’d lot to see you! Seems like every Schlotzsky’s I’ve ever frequented has closed 😦 I hope it’s not me! What a wonderful place Schlotzsk’s was in the early 70’s on S. Congress. There were no neon lights, no fountain drink dispensers that allowed you fill the 64oz cup with Mountain Dew passion blueberry three times, salads with 9 different dressings, flat bread, gourmet pizza, Cinnabons, 5 different breads, 8 different chips, or soup. There was one sandwich, that only came in one size 8″ . The only option that I remember was if you didn’t like the olives, you could ask them to 86 that item. BBQ sea salt with a hint of basil chips wasn’t offered, It was Lay’s Potato Chips , a pickle spear, and a Coke, Sprite or a Dr. Pepper. This sandwich shop and it’s location was as unique as Austin was at one time, and those of us who were born in Austin, and enjoyed the simple gratification of a fantastic sandwich before we went to the Continental Club or Armadillo World Headquarters for a concert miss those more simplistic times. I know I sound like a 50 year old man , because I am a 50 year old man, but the bottom line is The Original is all I’ve ever ordered and It’s all I will order, but it is still as great as it ever was. I’m just reading that Schlotzky’s is no longer in St Louis? My first Schlotzky’s was in St Louis on Manchester Rd. The sandwich was unbelievable. Even though it was not on my delivery route, I would meet my sister there (it was on her route) to have lunch. I always looked forward on the days we could each lunch together. I feel deep regret for St Louisians who can no longer get the best sandwich in the world. Please come back to St Louis. I now live in Oklahoma City OK and we do have the pleasure of “The Original” (plus jalapenos) to eat when ever we like. Please do not ever leave the Oklahoma City area. My husband was a student at UT in 1973……remember going to the original…..waiting for a seat…ordering the first Schlotzskys I ever had……wow…a blast from the past…..now fast forward to 2016….I’m sitting outside a Schlotzskys in Rio Rancho, New Mexico enjoying that same delicious sandwich…….yum, yum, yum….way to go! I think once a year I plead for Schlotzskys to return to the St. Louis/St. Charles area and it never happens. I guess It’s time to give up hope.